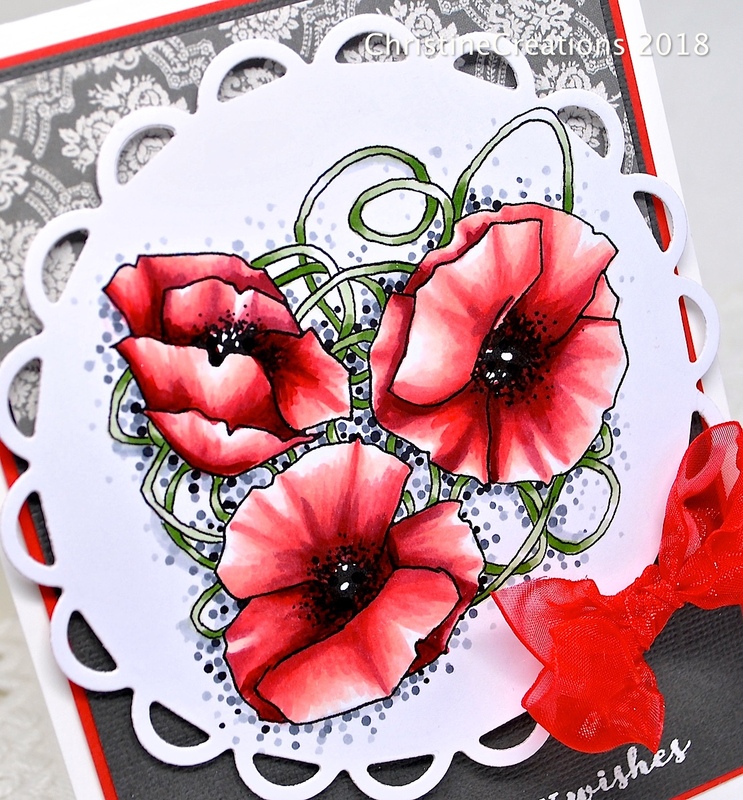 In November I had my annual card sale, and one of my friends couldn’t make it, but she asked if I could make her a red poppy card. She LOVES poppies. She has many pictures of them in her home, she has a gorgeous grey cape she wears that has a huge red poppy up on the shoulder. So, I pulled out my pretty digital set called Vintage Poppy Cluster from A Day for Daisies to create something for her. It’s such a great image for colouring with all those wide open spaces. One thing I did to really give the depth and pop to the colouring was to add some cool greys in the shadows of the red petals to really increase the depth of colour. If the shading gets too dark, you just run one of your lighter reds over top to tie it in to the main colouring better. As you can see I left some areas really light so there would be a lot of contrast between light and dark. It also helps your petals look really papery-thin. Then to also help the image pop I added a pointillism background with different tones of gray to really make the red feel center stage. A little organdy ribbon bow adds a bit of drama, and I shot my heat gun on it for just a few seconds to wrinkle the ribbon a bit more, and shrink it slightly. The sentiment is embossed on a nice dark grey textured card stock to really anchor or ground the image. Back tomorrow with a Power Poppy Friday, see you then! Christine, this poppy card is exquisite. 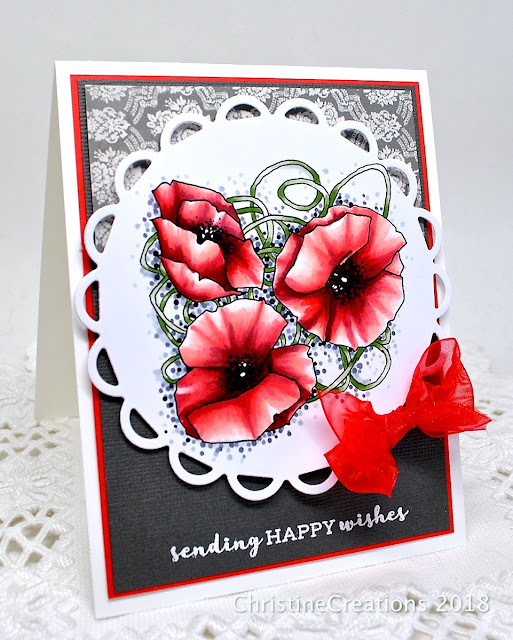 Thanks for sharing how you used the cool dark tones to add depth to these poppies. Know that I am always inspired by your creations. You have an annual card sale? That must be quite an event with all your droolworthy creations. Everyone must look forward to it. I would! All that beauty in one place. This is utterly divine, Christine! Your poppies look very papery, just as they should. So beautiful!